piLLAn is the illustrious son of periya thirumalai nambi and is also known as kurugEsar, kurugAthinAthar. emperumAnAr himself gave this name to him and instructed him to write the first vyAkyAnam for thiruvAimozhi which becomes to be popularly known as 6000 padi. emperumAnAr considers piLLAn as his mAnasa puthrar (abhimAna puthrar – dear son). Once many sishyas of emperumAnAr go to piLLAn and request piLLAN to request emperumAnAr to write a vyAkyAnam for thiruvAimozhi. piLLAn goes to the assembly of emperumAnAr, offers his obeisances and starts speaking. He says to emperumAnAr “You have written srIbhAshyam and travelled everywhere and established the visishtAdhvaitha sidhAntham. Now, we request you to write commentaries to AzhwArs’ pAsurams and protect them as well (so others dont misinterpret the same)”. Hearing this emperumAnAr replies “Yes, that is required. But if I write a commentary to AzhwArs’ pAsurams, people with limited intelligence will consider that there is only so much in AzhwArs works. And no one else will dare to write a commentary beyond mine. That will be an offense towards the great works of AzhwArs which are filled with great meanings which can be revealed by many authentic AchAryas in the future. So, I will instruct you to write the first commentary for thruvAimozhi which is equivalent in size to vishNu purANam (6000 slOkams – 6000 padi)”. Thus with the permission of emperumAnAr, piLLAn wrote 6000 padi vyAkyAnam and subsequently, this was taught by bhattar to nanjIyar. piLLAn was an expert in both srI bhAshyam and bhagavath vishayam. Once when piLLAn was at siruppuththUr, sOmAsiyANdAn learns srIbhAshyam thrice from him. sOmAsiyANdA n asks piLLAn to give him some valuable instructions and piLLAn says “You are an expert in explaining other philosophies and establish our philosophy through srIbhAshyam. Instead of being proud about that, always think that the lotus feet of emperumAnAr is our only refuge all the time”. While ascending to paramapadham, emperumAnAr, asks kidAmbi AchAn, kidAmbi perumAL, engaLAzhwAn, nadAthUrAzhwAn, etc to be surrendered to piLLAn and asks piLLAn to guide them. emperumAnAr also asks bhattar to guide every one including piLLAn and lead the sampradhAyam in his absence. Also, since piLLAn was considered by emperumAnAr himself as his own son, he leads all the charama kainkaryams (final rites) for emperumAnAr. In our vyAkyAnams, quite a few idhihyams that show the glories of thirukkurugaippirAn piLLAn are seen. Let us see some of them now. nAchiyAr thrumozhi 10.6 – periyavAchAn piLLai vyAkyAnam – Here ANdAL worships the peacocks that dance like krishNan. ammaNiyAzhwAn (an AchArya) use to offer obeisances to one of his sishyas. He says that since we worship srIvaishNavas and since if we know our sishya fully as a proper srIvaishNava, it is fitting to worship him as well. nanjIyar makes a point that if the sishya is not matured enough that will lead to ahankAram for him and sishya might fall down due to that ahankAram in his spiritual progress. But piLLAn explains that when a sishya is blessed by an AchArya like ammaNiyAzhwAn he will naturally be fully purified and that sishya will be fully at the disposal of ammaNiyAzhwAn – so the AchArya’s act is proper only. periya thirumozhi 2.7.6 – periyavAchAn piLLai vyAkyAnam – Here parakAla nAyaki’s (thirumangai AzhwAr in girl bhAvam) mother identifies her family as parakAla nAyaki’s family (instead of saying our family) since parakAla nAyaki is so glorious. piLLAn explains that this is similar to namperumAL himself naming our sampradhAyam “emperumanAr dharisanam” and invites srIvaishNavas as “rAmAnusan udaiyArs” (the ones who are connected to emperumAnAr). bhagavAn likes to see his devotees as the ones who are surrendered to srI rAmAnujar instead of being directly surrendered to him. Just like a beautiful necklace looks even more beautiful with the center stone, our srIvaishNava guruparamparai (https://guruparamparai.wordpress.com/2012/08/17/introduction-contd/) looks even more beautiful because of emperumAnAr‘s presence in the middle. thiruvAimozhi 1.4.7 – nampiLLai eedu vyAkyAnam – Here nammAzhwAr is in separation from emperumAn and is calling emperumAn as “aruLAtha thirumAlAr” meaning srIman nArAyaNan who is not merciful (which is contradictory since when emperumAn is with thAyAr he is most merciful). nanjIyar explains this as AzhwAr saying “You are with thAyAr who is most merciful but still you are not blessing me with your presence”. piLLAn views it differently and explains this as AzhwAr saying “emperumAn is fully immersed in the beauty of thAyAr; so is not taking his eyes/thoughts of her and blessing me”. thiruvAimozhi 6.9.9 – nampiLLai eedu vyAkyAnam – AzhwAr cries out to emperumAn to relieve him from the pains of this samsAram and bring him over to paramapadham. piLLAn was in his last days was repeating the words of AzhwAr and praying to emperumAn. Seeing that, nanjIyar starts crying. At that time piLLAn asks nanjIyar “Why are you crying? Are you thinking that the glorious life in parampadham that I will be getting is lower than the life here? Please stop crying out of anguish and feel happy for me”. 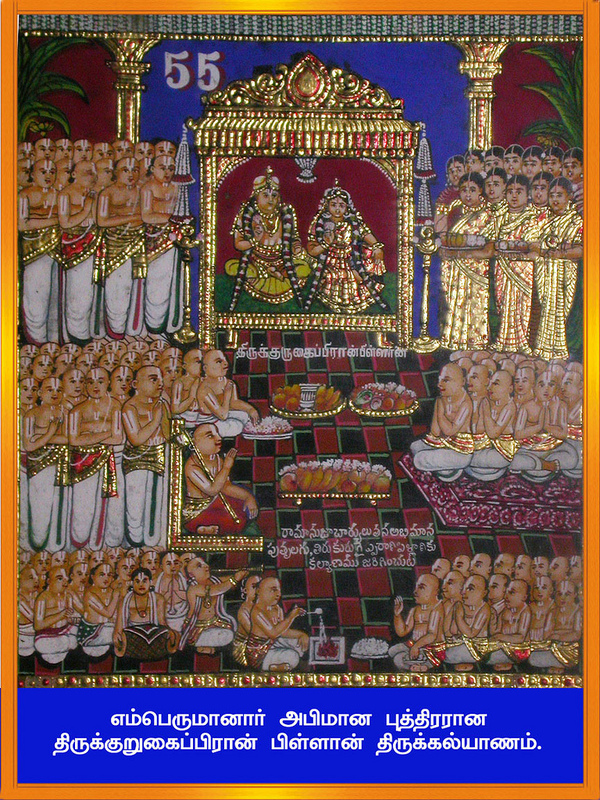 In charamOpAya nirNayam (http://ponnadi.blogspot.in/p/charamopaya-nirnayam.html), the following incident is explained. When udayavar was explaining thiruvAimozhi meanings to thirukkurugaippirAn piLLAn (who is his abhimAna puthran), while explaining “poliga poliga” pAsuram, piLLAn was filled with ecstasy and emotions. Noticing that, udayavar enquired him what caused this changes in his emotions. piLLAn replies “AzhwAr hailed ‘kaliyum kedum kaNdu koNmin‘ meaning kali will be destroyed, with your appearance in his thiruvuLLam. Per his declaration, you have also revealed that you are that great AchAryan everytime you explained thiruvAimozhi. Thinking about those, I am unable to control my ecstasy and emotions thinking that I am so fortunate to have the sambandham (relationship) with you (who is uplifting everyone per AzhwAr’s divine revelation) and to hear the divine meanings of thiruvAimozhi from your divine self directly”. Hearing this, udayavar was very pleased. That night, he invites piLLAn and brings him to pEraruLALan (udayavar’s thiruvArAdhana perumAL), keeps his lotus feet on his head, and tells him “Always depend on these lotus feet as your refuge; Always show these as the refuge to the ones who surrender unto you as well. Tomorrow, you start writing a commentary to thiruvAimozhi in srI vishNu purANam style (vishNu purANam has 6000 slOkams), i.e., in 6000 lines”. Thus udayavar revealed his uththArakathvam himself to piLLAn who is very dear to him. sUthram 122 – limitations of bhakthi yOgam – In a golden pot which is filled with pure water, if there is a little bit of alcohol (or any intoxicating food) mixed, that water becomes un-drinkable. Similarly, jIvAthmA (golden pot) when filled with bhakthi (pure water) is mixed with a tinge of ahankAram (poison) that leads to svarUpa virOdham. While it is desired that there is no ahankAram in bhakthi, it is impossible to expect that since by definition bhakthi yOgam means there is a performer of that process and that performer has the attitude that he is doing something to please bhagavAn. So, piLLAn says that bhakthi yOgam is not natural for the jIvAthmA and only prapathi (total surrender – accepting that emperumAn is the only upAyam) is the natural process for jIvAthmA to achieve emperumAn. sUthram 177 – glories of paragatha svIkAram – i.e., emperumAn blesses jIvAthmAs out of his own causeless mercy and it emperumAn’s own efforts which brings us the ultimate benediction (kainkarya prApthi). Any self effort from the jIvAthmA to achieve emperumAn will only lead to undesired effects since it is not the nature of jIvAthmA to be independent and make his own effort. This is explained using an example as follows: When we achieve emperumAn through self effort, that is like giving milk that is purchased from the store. When we achieve emperumAn through emperumAn’s grace, that is like giving mother’s milk to the child. So, paragatha svIkAram is compared to mother’s milk which is the most natural feed for the nourishment of a child. As mAmunigaL identifies in upadhEsa rathina mAlai (pAsurams 40 and 41) – without the 5 vyAkyAnams for thiruvAimozhi we can never understand the real meanings of thiruvAimozhi. mAmunigaL glorifies piLLAn as “theLLArum gyAnath thirukkurugaippirAn piLLAn” meaning piLLAn has absolute clear knowledge about bhagavath vishayam. He also glorifies that piLLAn revealed the divine meanings of thiruvAimozhi with great love and the vyAkyAnam is most relishable. Subsequently nanjIyar wrote 9000 padi on the orders of bhattar, nampiLLai‘s kAlakshEpams were recorded as 36000 padi by vadakku thiruvIdhi piLLai, periyavAchAn piLLai wrote 24000 padi on the orders of nampiLLai and vAdhi kEsari azhagiya maNavALa jIyar wrote 12000 padi explaining the word by word meanings of thiruvAimozhi pAsurams. Thus, we have seen some glimpses of the glorious life of thirukkurugaippirAn piLLAn. He was fully situated in bhAgavatha nishtai and was very dear to emperumAnAr himself. Let us pray at his lotus feet that we too get a little bit of such bhAgavatha nishtai. This entry was posted in other AchAryas on April 14, 2013 by sarathyt. Thanks very much for a beautiful coverage of Thirukkuruhai PirAn PiLLAn’s divya charittram.